One of my favorite sources of inspiration is the subway. I am constantly seeing a wealth of fashion inspiration and mostly from the men. I see men wearing a certain combination of colors, textures and proportion that I find incredibly inspiring. Perhaps it backlash from my years of ultra-girly sartorial choices, but the other day I saw a man wearing brown chukka boots with black pants with a checked shirt, tweed coat and scarf in varying shades of grey. Last Friday that stranger was my fashion inspiration. Can never go wrong getting inspired by menswear. Personally, I don't think the dudes get enough credit. I swear I've seen way more guys decked the eff out lately..it's wonderful. You look great btw! Slightly Annie Hall-esque, it's lovely. This whole look is very classy, cute, and looks cozy. Great cardi! It suits your eyes so beautifully! I feel like I'm still stuck with super-girly stuff, and also have no real intent to go shopping, so I guess I'm going to be endlessly inspired, but unchanging for the next few months. I do like guy-style... I always thought it was for the human coat-hangers of the female world, but you're a normal shape and look awesome so maybe it's all just about proportion..
"Human coat hangers of the world" made me laugh really hard! 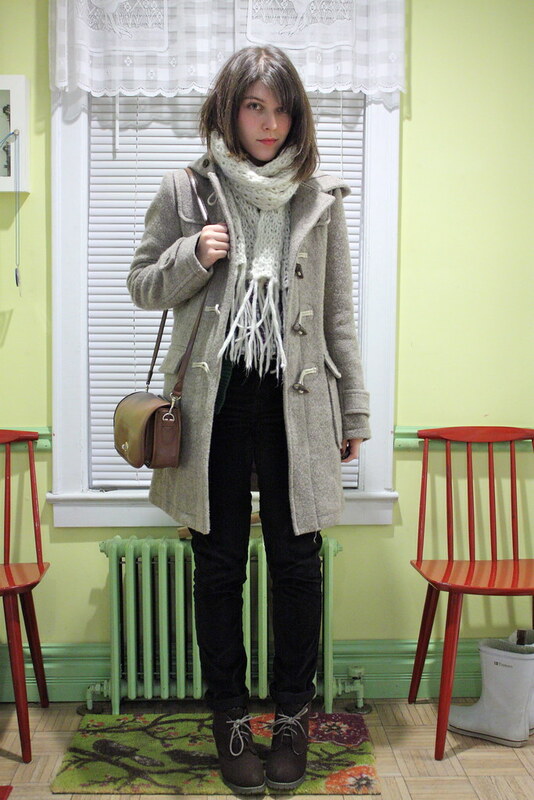 Great outfit, I love menswear inspired looks, they're always that tiny bit more chic. Seeing as I'm on the subway all the time as well, it's definitely a great place for some awesome inspiration. Loving your shoes. Regardless of where the inspiration comes from (and dudes on the subway seems as good a place as any), the end result is super cute! 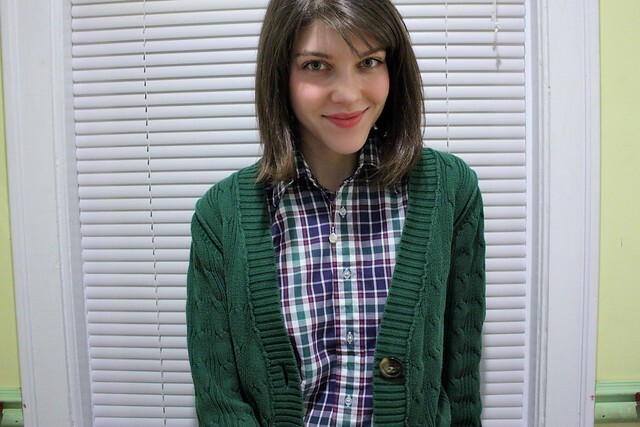 the green cardi is too perfect! Well the outfit turned out great! You look wonderful, and very cozy in that cardigan. you look so cute! love the coat! beautiful shirt and boots!! amazing bag and cadigan and i adore your coat!! you look beautiful!! 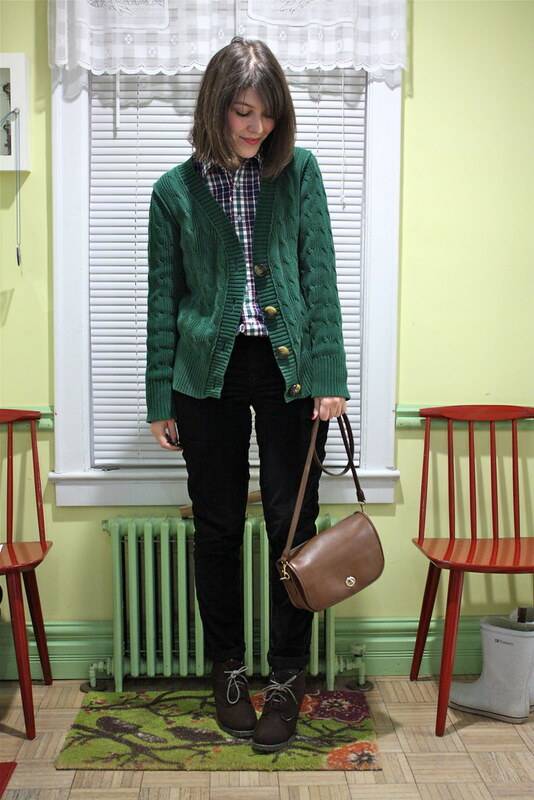 I got a vintage green cardigan for Christmas and for some reason I've been thinking it would go wonderfully with black pants (shocking, since I hate wearing pants). Thanks for confirming that assumption without me even trying it on! You look great in green hun!! What are you wearing on your lips? love it! Such a nice scarf! Love the shoes! We need warm clothes like this where I am. Thanks for the note. Nivea Touch of Flavor in Cherry. Its the best everyday chapstick because its got a hint of color! wicked cute outfit. the subway is full of fashion forward folks..that and piss..and maybe vomit...but mostly good looking people in cool clothes. Hahaha its not that bad during rush hour. I mean, its bad, but not a toilet (yet). that cardigan is such a nice, cozy colour! you look so cute. I hardly ever take the subway (terrible new yorker, I know) but when I do it's always kind of wonderful seeing so many different people and styles all packed into one place. This is such an awesome outfit! This outfit is so awesome and casual. It's exactly what I've been wanting to wear lately, but I lack cool pants like the ones you have! I really love your shoes and cardigan too. there's no better inspiration than the streets.